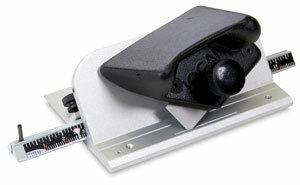 Make precise 45 degree beveled cuts. Pull-style professional cutters. Fingertip-operated, pivoting blade holder. Start/stop indicator controls overcuts. Marker system for borders. Made of high-tech aluminum alloys. This pull-style, professional cutter has a fingertip operated, pivoting blade holder. A start-and-stop indicator controls overcuts. Also has a special built-in marker system for quickly marking borders from ¼" to 5½" wide.